In today’s tough economic times, where every person is being judged by his/her number (credit score), having a good credit and credit score is more important than ever before. You need to have a good credit just to rent an apartment, rent a car, open a bank account, get auto and home insurance, get a job, buy a car or obtain a home mortgage. Just a few points on your score can be the difference between getting a home loan, auto loan, or even a credit card. Depending on your credit score you could be denied of getting a loan, would be offered a good or normal rate, or would be offered a loan with higher than normal rate and/or requiring more down payment, etc. Like most cases in finance, those with the lowest risks get to pay the lowest rates. Approximately 70% of Americans have some form of negative information on their credit reports! · 26% of American adults (about 61 million) do not pay all of their bills on time. · 14.2% of consumers fall into the 300 to 549 FICO score range. This is the lowest score range that no lender gives loan to anybody for any purpose. · 61% of American adults failed the basic finance test. · The Federal Trade Commission’s February 2013 report shows that as many as 26% of people have an error on their credit report. · Know your rights under the Fair Credit Reporting Act. Do yourself a favor and save some money, too. Don’t pay fees to “repair” your credit history. Do It Yourself: Obtain a copy of this book, “Credit Score: Tips and Tricks on how to improve your credit score” and start improving your credit score free. To order your book click here. What is in this book for you? Unfortunately, it is becoming increasingly common for information in the credit reports to be considered in employment decisions, approving loans, auto and home insurance, getting credit cards, etc. Credit reports and scores play a major role in determining for which mortgage product or loan you will qualify, and to which rate you will be assigned by your lender. This book was designed to help consumers understand what a credit report and a credit score is, how to establish or re-establish a good credit history, manage their credit reports and provides tips and tricks on how to improve their credit scores. In summary, this book provides answers to the following questions. · Who are the major credit reporting agencies in U.S? 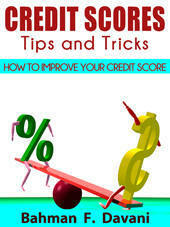 · Why credit scores are so important? · What is a credit reports made up? · What is a credit scores made up? · How much a slightly bad credit score cost me? · How much an increase of 1% in interest rate cost me? · Where and who should I contact to correct an error in my credit report?